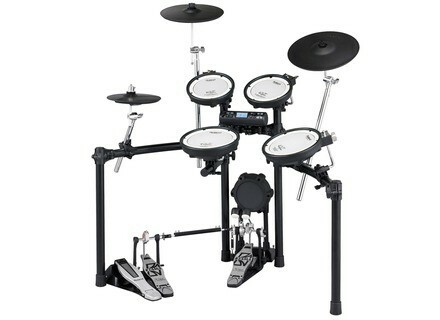 TD-4KX2, Electronic Drum Kit from Roland in the TD series. Roland introduces two new entry-level kits in the V-Drums range: the TD-4K2 and TD-4KX2. These electronic drum kits feature coach and recording functions. Both kits include the TD-4 Percussion Sound Module, with drum kits that can be edited and customised. Ambience effects optimised for drums are also included while the Coach and Quick Record/Quick Play functions are good for practising, providing drummers with feedback. The TD-4KX2 features Roland's multi-layer mesh heads for the snare and toms. The new KD-9 Kick Pad is designed to provide accurate triggering and a natural response with a cloth-designed bass drum head. The CY-13R ride (with three-way triggering) and CY-12C crash V-Cymbals both offer a more natural swinging motion and playing feel, Roland says. The TD-4K2 also features a mesh head for the snare as well as the KD-9 Kick Pad. The TD-4K2 is also expandable with an optional V-Pad or V-Cymbal. Check out Roland for more. [NAMM] Roland TD-9K2 & TD-9KX2 V-Drums Roland introduces two new intermediate kits in the V-Drums range: the TD-9K2 and TD-9KX2. [NAMM] Natal Drum Kits Natal, recently acquired by Marshall, has unveiled a new line of drum kits. [NAMM] Alesis 2011 DM10 Studio Kit Alesis announces the 2011 edition of the DM10 Studio Kit, featuring Alesis' new four-post StageRack with upgraded clamps and mini-boom cymbal arms.